http://media.blubrry.com/w2l7/p/media.blubrry.com/noodlemx/p/welcometolevelseven.com/wp-content/podcast/WTL7_245AoS.mp3Podcast: Play in new window | DownloadThis is a massive milestone – EPISODE 100! To celebrate, the Agents of SHIELD face their greatest fears! And some old friends return! And a family dynamic is born (with the promise of some actual births in the future). http://media.blubrry.com/w2l7/p/media.blubrry.com/noodlemx/p/welcometolevelseven.com/wp-content/podcast/WTL7_244AoS.mp3Podcast: Play in new window | DownloadAgents of SHIELD has returned! The team has returned! And the podcast has returned! What will happen in the lead up to next week’s episode 100? What’s the newest new normal? Find out here! 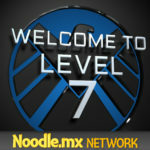 http://media.blubrry.com/w2l7/p/media.blubrry.com/noodlemx/p/welcometolevelseven.com/wp-content/podcast/WTL7_242AoS.mp3Podcast: Play in new window | DownloadThe Agents of SHIELD mid-season finale ends on a cliffhanger, of course. But what a cliffhanger!!! We get battles, prophecies, sacrifices, and deaths, both tragic and surprising. All this and a post-credit review of the BLACK PANTHER PRELUDE comic! http://media.blubrry.com/w2l7/p/media.blubrry.com/noodlemx/p/welcometolevelseven.com/wp-content/podcast/WTL7_239AoS.mp3Podcast: Play in new window | Download It’s the future! It’s space! It’s mysterious! It’s strange! It’s Agents of SHIELD at it’s best! http://media.blubrry.com/w2l7/p/media.blubrry.com/noodlemx/p/welcometolevelseven.com/wp-content/podcast/WTL7_237AoS.mp3Podcast: Play in new window | Download Clark Gregg steps into the director’s chair as Daisy and May step into the arena! People fight! People die! People are separated and people are brought together! http://media.blubrry.com/w2l7/p/media.blubrry.com/noodlemx/p/welcometolevelseven.com/wp-content/podcast/WTL7_230AoS.mp3Podcast: Play in new window | DownloadThe future of broken earth is not a bright one, but the future of this season of Agents of SHIELD sure seems to be! Another episode IN SPAAAACE brings Inhumans, new aliens, and a mysterious transmission!